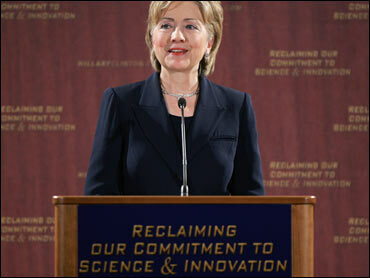 Democrat Hillary Rodham Clinton said Thursday she would sign an executive order rescinding President Bush's restrictions on federal funding for embryonic stem cell research. Her address to the Carnegie Institution for Science was timed to coincide with the 50th anniversary of the launch of the Sputnik satellite by the Soviet Union. The launch, which caught U.S. scientists by surprise, helped start the U.S.-Soviet space race and led to the creation of National Aeronautics and Space Administration. The candidate said as a little girl she was fascinated by Sputnik, but that today's scientific challenges often come from political ideology instead of foreign powers. She said Mr. Bush's limits on federal funds for embryonic stem cell research amounts to a "ban on hope." On the campaign trail, Clinton has repeatedly slammed what she calls Mr. Bush's "war on science" and accused the administration of allowing conservative political ideology to interfere with research and scientific evidence. She cites administration officials who have questioned the scientific evidence of global warming and who have suggested a link existed between abortion and breast cancer. Expand human and robotic space exploration and speed development of vehicles to would replace the space shuttle. Launch a space-based climate change initiative to combat global warming. Create a $50-billion strategic energy fund to research ways to boost energy efficiency and reduce reliance on fossil fuels. Comply with a legal requirement that the executive branch issue a national assessment on climate change every four years. She would also expand the assessment to reflect how U.S. regions and economic sectors are responding to the challenges posed by climate change. Name an assistant to the president for science and technology, a position that was eliminated in the Bush White House. Re-establish the Office of Technology Assessment.